Still – I was musing about the time I started this blog, and its purpose. I had imagined I would write a letter to my Mom here every day, or as often as I could. Somewhere down the road, it became more of sharing only some things – I realized many things were too personal to share – and anyway, Mom lives, in spirit, in our hearts and at home – and the best way to feel good was to talk to each other at home – which we do all the time.We also find more fulfillment in interacting with real people face to face – and that is infinitely more enjoyable. I am talking about real people who knew her and loved her. Over the past year, I have had the privilege (I quite like that word) of making some wonderful new personal as well as professional connections. A bigger privilege has been that of strengthening old connections and the joy that comes from that is unequaled. I have also learned many things – about people. And thanks to the wonderful teacher my Mom has always been, I find it easier to cope with many situations. I have learned that it is really not necessary to make everyone happy. People who genuinely care do not lay down rules in a relationship. In fact, tolerance for the differences of opinions makes for a stronger bond. It always amazes me how some people do not apply the sense of justice they have for themselves to others also. Instead, they simply rave and rant and believe that only they are right. It always makes me curious – how can one simply write off the good things? How can they imagine that they are the only ones hurt? Well – I’ve never had the habit of dropping relationships according to whim, and certainly don’t plan to start now. Which is why am blessed with such wonderful people in my life, so thank you, dear ones. Summer is here, and we were recalling how Mom would admire Sury for carrying curd rice for lunch everyday along with a subzi. I am sticking to roti and subzi as that is more reliable. The curd – no matter how clever we are – does tend to sour a bit and that’s quite boring. I remember the mornings when Mom and I would keep joking in the kitchen together – me cutting the veg, she insisting on making the curry – me kneading the dough – and she insisting on rolling out the parathas. I would keep telling her that she’s crazy to actually want to sweat in the kitchen doing it when she could be timepassing with Vidur instead. But she would always say that it made her feel good to do it. I keep thinking how lucky I am that I had her for my Mom. What fun it was. 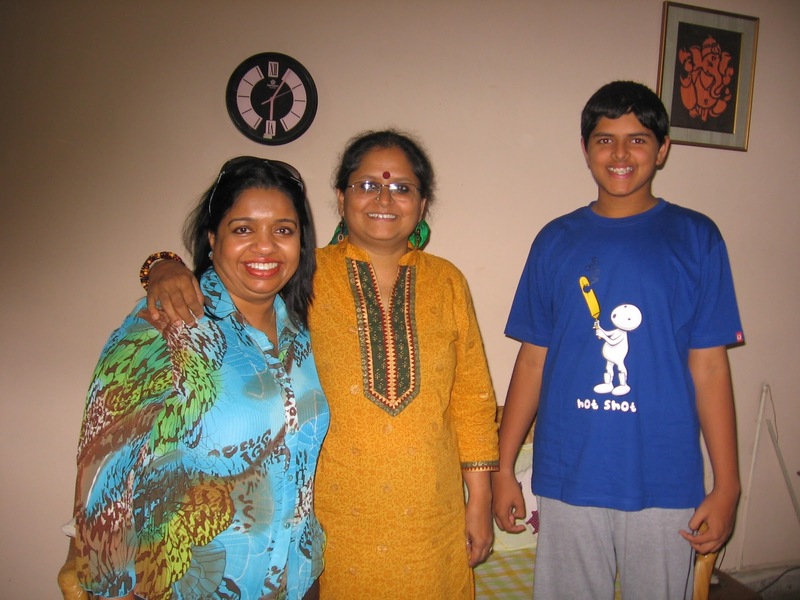 Hard to believe that Vidur’s final exams finish tomorrow – and on April 1, he will begin a new academic year in Class 9. Phew! Always takes me back to 2003 when he joined the school in Class 1. Hmm…also got my Honda Activa just before school reopened. I remember how he would stand in front – Mom would come downstairs to the garage every day to send us off – saying ta ta until we went out of sight and repeatedly telling me to be careful. On Saturdays, both of us would go to bring Vidur back from school – and often stop at the bakery on the way back so we could stuff ourselves. That’s when we discovered the “apple cake” which, when Mom asked the bakery guy, turned out to be something ingeniously simple to make. And then it became a regular dessert at home. Mom would also insist on carrying some juice and snacks for Vidur’s teachers saying, “paavam. they have to work so hard in this heat – correcting papers and staying back at school”. 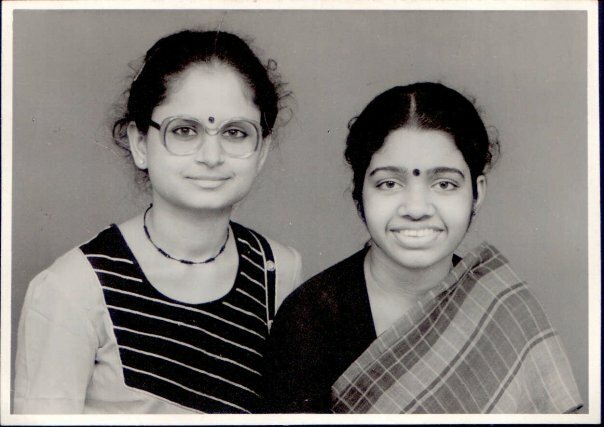 And just for the heck of it, here’s a pic of us in 1984 we actually walked all the way to Mount Road from Besant Nagar (don’t ask why) and into G K Vale – to have this pic taken. The amazing thing here is: when G K Vale renovated about ten years later, they actually managed to forward the negatives to my address. I was impressed. Hey, what can I say? As Mom always told me – look at the positive stuff. Enjoy it. The downs are simply learning curves. Right, Mi. I love you.